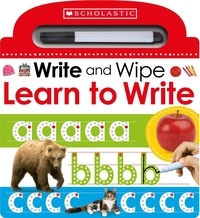 Write and Wipe: Learn to Write is perfect for helping children who are learning to write their letters. The book comes with a wipe-clean pen and the glossy board is easy to clean, so that children can try a page, wipe it clean, and try it again! This interactive book uses dots and arrows to show children exactly how to write all the letters of the alphabet, both capitals and lowercase. It also provides words to trace for each letter, developing children's awareness of letter sounds.